What's My Name's Hidden Meaning? Wow that was cool! Just typed in my name and there I have it several lines of my personality, traits and characteristics which somehow describes me truly at least 95%. I'm frank, open, friendly, adaptable, warm, happy and charming when I want to Lol! Try this quiz out and I'm sure you'll enjoy this! I’m fond of collecting different figurines when I was still single and I collect ceramics, glass and some other types of figurines. It brings me contentment every time I bought a set or two and displays it in our cabinet. Until now I have some of my collections except for the ones which were accidentally broken. I love looking at them which also brings me to remember the old days when I would go to my favorite store where I get my figurines for affordable price which makes me return for more. Now I have so many things in mind that I stopped some of my favorite collection hobbies but I was glued to online searching for my favorite things, of course I also want those items with discounts and this cheap crystal figurine I found online caught my attention because of the models they used for their crystals. They used cute characters which are perfect additions for my collections. 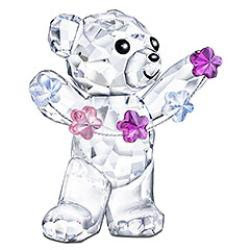 I particularly liked the Swarovski Kris Bear Flowers design. It cost only $72.00 and it’s perfect also for gifts.